Advanced Information Technologies, are expected to be automated by Natural Wisdom we all share as billions of people expected to employ and use what we have named as Universally Intelligent EchoLogical Computers & Robots + Internet.||. Here is a sample of the code added to text, so that pronunciations can be verified by machines as well as people, as English has a problem with more then just writing proper names of places and people! 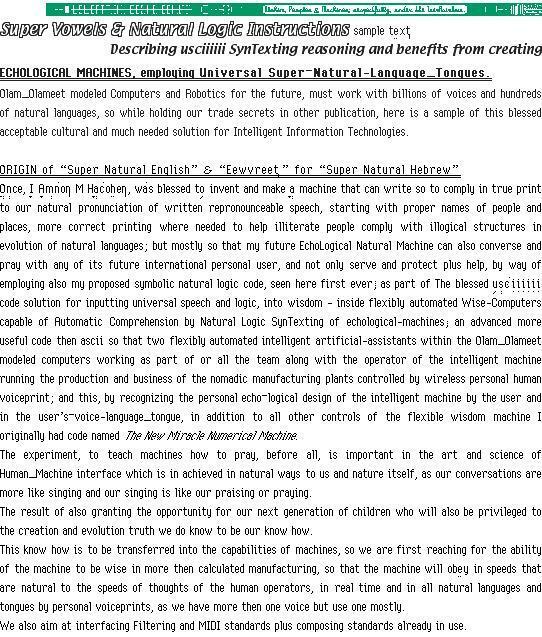 There are also logic instructions, to overcome the limitations of AI Artificial Intelligence methods. There are more symbolic instructions needed by machines and people for full Universal Speech Comprehension and Automatic Processing of InterCultural Translations at the highest quality capabilities needed for Educational and Trading applications. Some of the CODE can not be seen, as it appears in green here, protecting the more confidential Trade Secrets - for Proprietary and Patenting Reasoning!